Key observation: 60hz frame rates are central to good mobile experience. SAN FRANCISCO, CA—Although Google's keynote at the I/O conference this week focused heavily on the APIs and behind-the-scenes development of the Android operating system, it looks like there's a lot more in store. This idea was especially apparent in a panel discussion today involving eleven members of the Android development team. 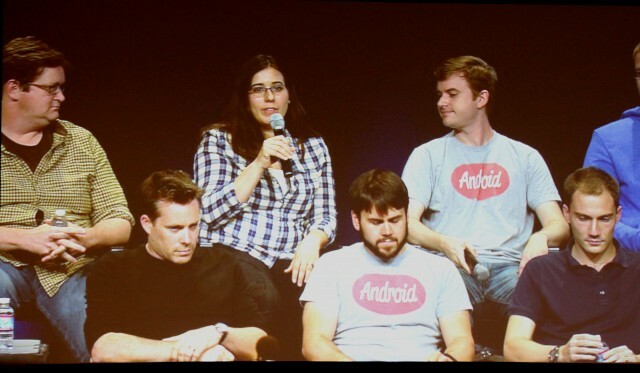 The team sat for a forty-minute question and answer session, and while they dodged most inquiries about forthcoming features for Android, they did offer a bit of insight into what the future of Android might look like, what developers could do to help further the platform, and what they've learned from their journey thus far. The conversation began with a question relating to whether or not the Android team would have done anything differently from the beginning. Senior Android Engineer Dianne Hackborn said the team "should have had more control over applications. A big example is the whole settings provider, where we just let applications go and write to it... it was a simple thing that we shouldn't have done." Ficus Kirkpatrick, one of the founding members of the Android team and the current lead for the Google Play Store team, added that "you're never going to get everything right the first time. I don't really regret any of the mistakes we've made. I think getting things out there at the speed we did…was the most important thing." The team also briefly touched on fragmentation and how they're working to combat the issue—it was even referred to as the "F" word. "This is something we think about a lot," said Dave Burke, engineering director of the Android platform. He explained that many silicon vendors take the open source code, break it apart, and create their own Board Support Packages (BSPs) to make their hardware compatible with the software. To streamline the process, the Android team made the code for the platform more layered, so if a vendor needs to make changes, they have a clean abstraction layer to do so without affecting the entire operating system.